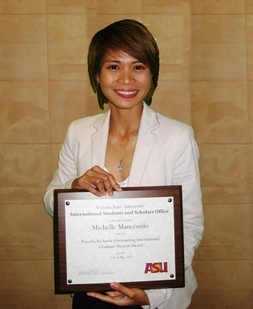 Industrial engineering doctoral student Michelle “Mickey” Mancenido, a native of the Philippines, is the 2011 winner of the Outstanding International Graduate Student Award presented by Arizona State University’s International Students and Scholars Office. With the honor comes support from the Priscilla Richards Memorial Endowment for her Ph.D. studies in the School of Computing, Informatics, and Decision Systems Engineering, one of ASU’s Ira A. Fulton Schools of Engineering. The award is presented to a student with a record of exceptional academic achievement, who also demonstrates a strong commitment to the community and involvement in the university. In addition to her studies and research, Mancenido is an officer in the student division of the International Council of Systems Engineers, and has been elected its treasurer. She has helped lead the organization by participating in international meetings and assisting in formulating goals for the future of the council. Mancenido also won the award on the strength of an essay about her career goals. Her studies focus on industrial statistics – involving the design of methods to ensure quality control and optimal effectiveness of production systems. 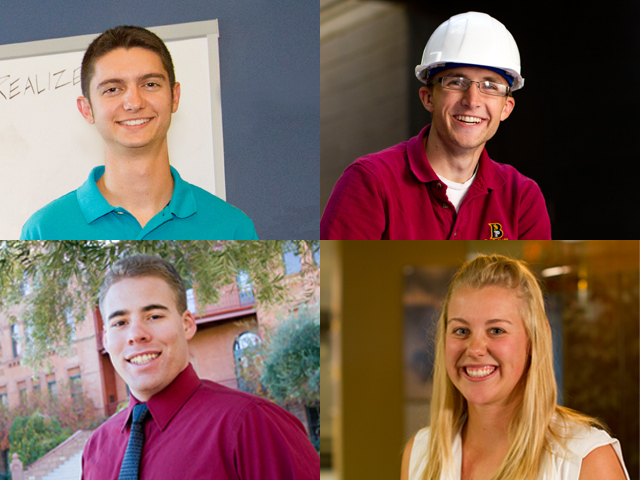 “Mathematics has always been my strength, and I’ve found industrial engineering a valuable way to apply math,” she explains. Mancenido, who grew up in the Philippines’ capital city of Manila, says she hopes to eventually help lead her country to the forefront of advances in the field. She is a faculty member on leave from the University of the Philippines, where she began teaching several years ago. She decided to pursue her Ph. 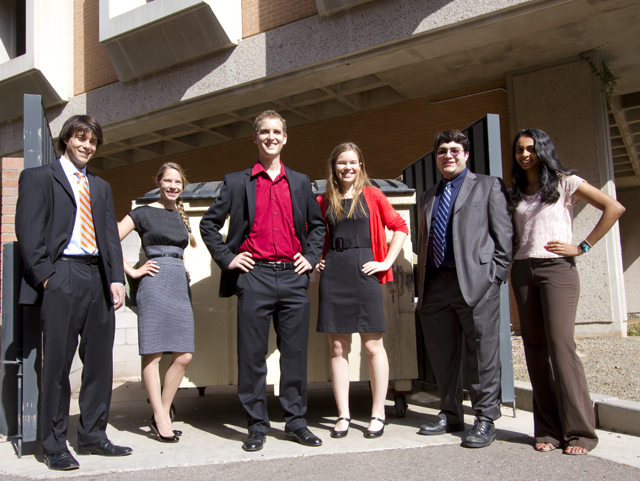 D. at ASU, she says, because of the strength of the industrial engineering program, particularly the reputation in the statistics field of ASU Regents’ Professor Douglas Montgomery. 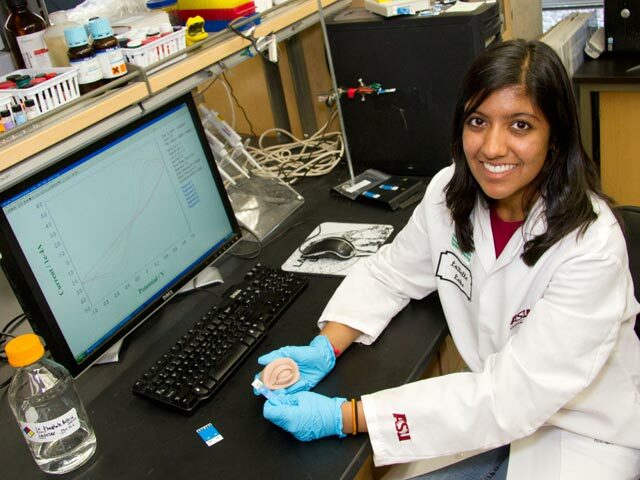 Mancenido says she is dedicating her Outstanding International Graduate Student Award to Nong Ye, an ASU professor of industrial engineering and computer science. Ye teaches “in a way that makes me look differently at problems and solutions. She always challenges us to think creatively, by discussing her own research interests and presenting more questions than answers,” Mancenido explains. “Going into this program, information systems wasn’t my strongest subject, but I did well in professor Ye’s course because I couldn’t help but be inspired by someone who teaches the subject so passionately,” she says. Ye says Mancenido “is among the most promising international students” she has taught, citing her commendable performance in course work and also her ability to develop new ideas through her research. 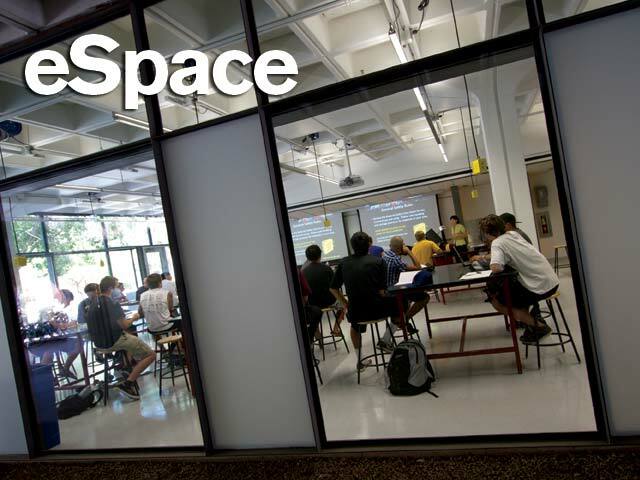 Away from the classroom, she has also found the opportunity at ASU to return to her love of competitive fencing. Mancenido was a member of the Philippines’ national fencing team until a few years ago, when she left because of increasing work and school commitments. Now she is competing for ASU’s collegiate fencing team. She recently placed first in the women’s individual foil and first in women’s team foil competitions at the Fencing Conference of Southern California. In April, she helped lead the ASU women’s foil team in winning the 2011 United States Association of Collegiate Fencing Clubs national championship. Now she’s hoping to prime her skills sufficiently to qualify for a place on her country’s 2012 Olympics team. Mancenido is the first recipient of funding from the Priscilla Richards Memorial Endowment. The endowment was established in memory of Priscilla Richards by her mother, Oline Richards, and other family members. Priscilla Richards worked at ASU from 1970 until June 1986, including positions in the Hayden Library and, for five years, as an assistant to the ASU international student advisor. In 1986 she was awarded the President’s Citation for dedication to international student programming. The International Students and Scholars Office also recently presented the Outstanding International Undergraduate Student Award to Cong Wang, of China, a communications major, and the Outstanding International Student Leader Award to Ryan McKenna, of Canada, an economics and finance major in the W. P. Carey School of Business and ASU’s Barrett, The Honors College.